Are you a fan of extra chillies in your food? A new spicy sauce created for the spice lovers will leave you with a tingling sensation like that of a spider bite! 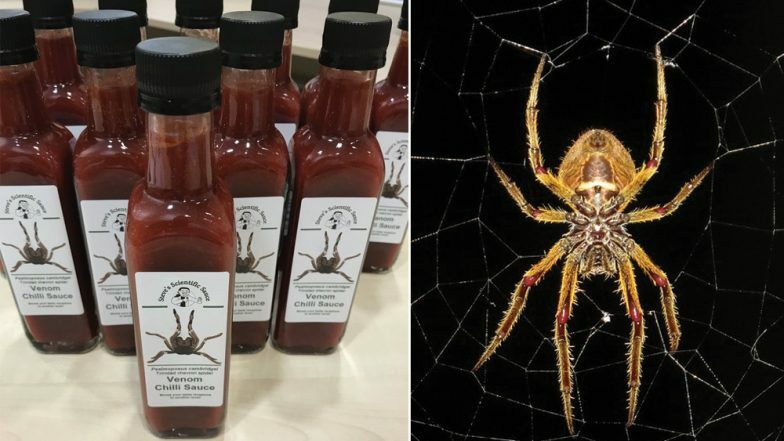 British scientists have created a world's first chilli sauce that mimics a venomous spider bite. Called Steve’s Scientific Sauce, it is first of a kind product made that's so spicy that it leaves the person with a tingling burning sensation. It was designed using lab tests on hundreds of arachnids. And the product is already a hit, with it going off the racks almost immediately. Spicy Tomatoes Will Soon Become a Reality as Scientists Will Genetically Engineer the Fruit. Venomtech, a Kent-based drug discovery business has developed this sauce as a "side project" while they were researching on venomous arachnids. The burning sensation felt after having this sauce mimics the bite of the Trinidad chevron spider. Managing director and founder Steven said to New York Post, "It’s as best as we can manage without actually tasting the venom. It’s a similar heat component that the venom would cause." 17-Year-Old from Tennessee Had Her Gallbladder Removed After Eating 4 Bags of Spicy Hot Cheetos Every Week. They thought of making the sauce about two years ago while they discovered that this particular spider venom works on the same receptors as capsicum. They then decided to make a spicy condiment. It wasn't an easy process and required funding, to ensure that venom was safe for human consumption. They isolated the component from spider's venom which is safe. They took about 300 spiders for the initial batch, which came up to 48 bottles. After the initial success, scientists are now planning to make adaptations to the same. The next plan is to make mayonnaise by mixing in this sauce. Trim Steve was quoted, "You get a really nice dipping sauce and that will be called Venomaise and that's the product we'll be launching later this year." Are you up for the world's safe venom-infused chilli sauce? It is currently available only in Macknade Fine Foods.